Halloween is nearly upon us and that means Black Friday and Cyber Monday (BFCM) are just around the corner. BFCM are the biggest days on the eCommerce calendar, and for many stores, they can drive the lion’s share of revenue for the entire year. Last year, Black Friday was the biggest sales day in eCommerce history. That means you need to make sure all your lifecycle email marketing campaigns are locked and loaded, while we’re continually improving Jilt to make your campaigns work better for you and your store. Read on to find out about our new customer tagging feature, which takes segmentation and personalization to a new level, improvements to our product recommendations feature and more. The best way to get more value from your emails is to target them and personalize them for your customers. Consider some of these stats: According to Europe’s Direct Marketing Association, segmented and targeted emails are responsible for generating 58% of all email marketing revenue (PDF), while an Experian study found that personalized emails lead to six times higher transaction rates. That’s not surprising, since people open and engage with personalized emails at a significantly higher rate than non-personalized messages. 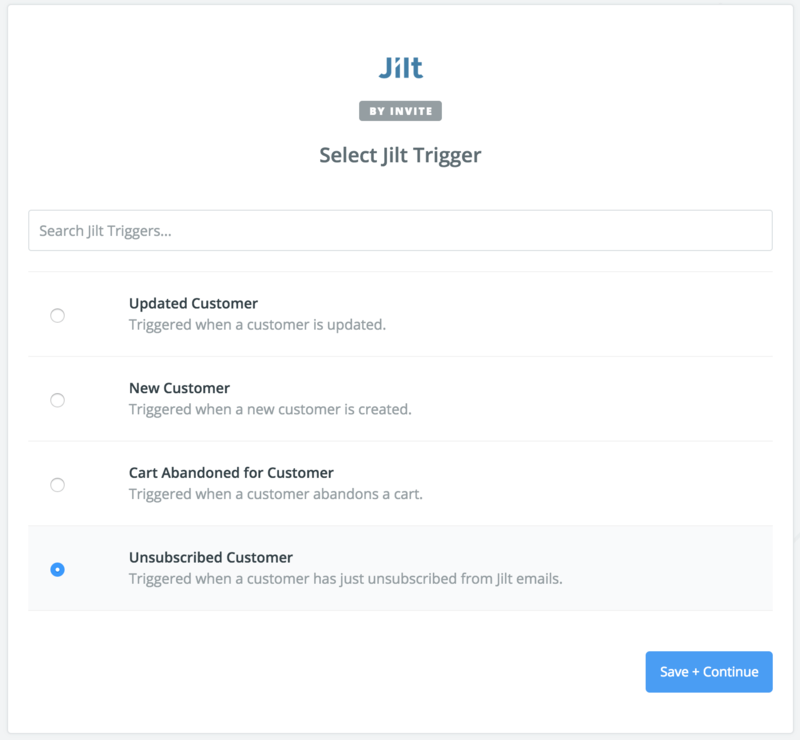 Jilt has a number of built-in tools to help you target and personalize your emails. With our segmentation engine, you can break up your customer list by attributes like location, order value, or purchasing behavior, and with Liquid merge tags, you can personalize emails with things like a customer’s name or cart details. Now we’re adding customer tags to the tool box! 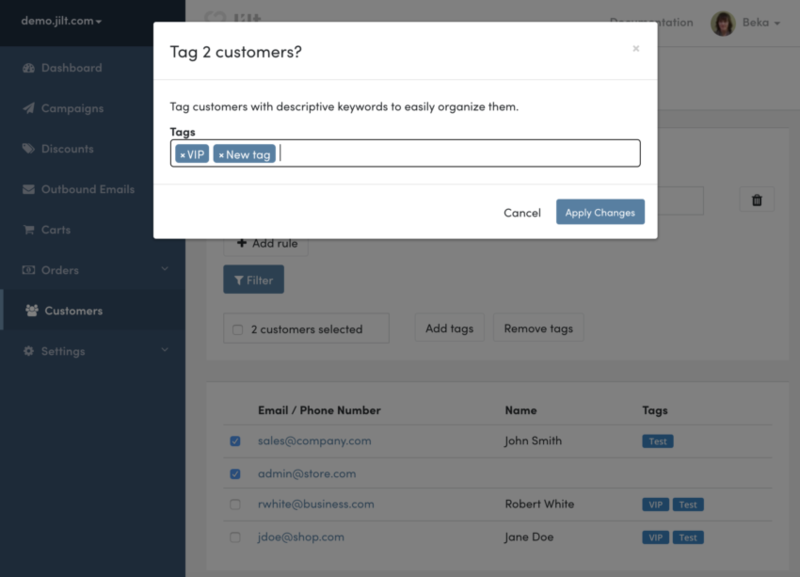 Customer tags let you differentiate your customers and group them however you want. 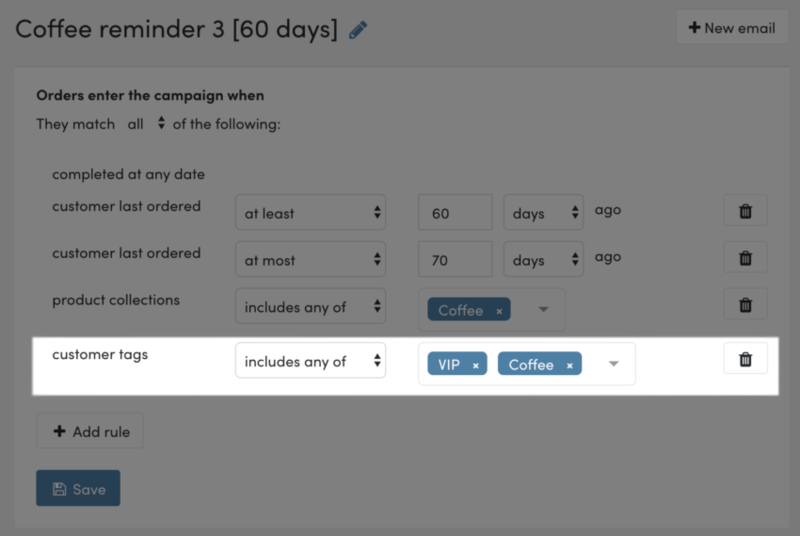 For instance you could create a “VIP” tag and apply it to any customers who have spent over a certain amount or who have ordered more than some number of times. Or you could create a “social promoters” tag and apply it to any customer who has shared their purchase on social media. You’re not limited in how you decide to group customers using tags, so you can use them to create new segments for attributes that Jilt may not yet track. You can add or remove tags in bulk for your customers (see our new customer filtering feature below), or on an individual basis. The tags you create can then be used in campaigns to target emails to a specific segment. 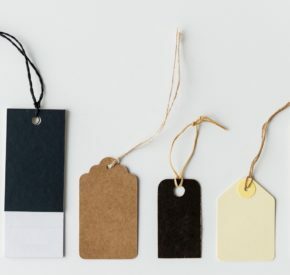 For Shopify stores: Jilt will import existing tags directly from Shopify, so you can use these to segment your campaigns as well. 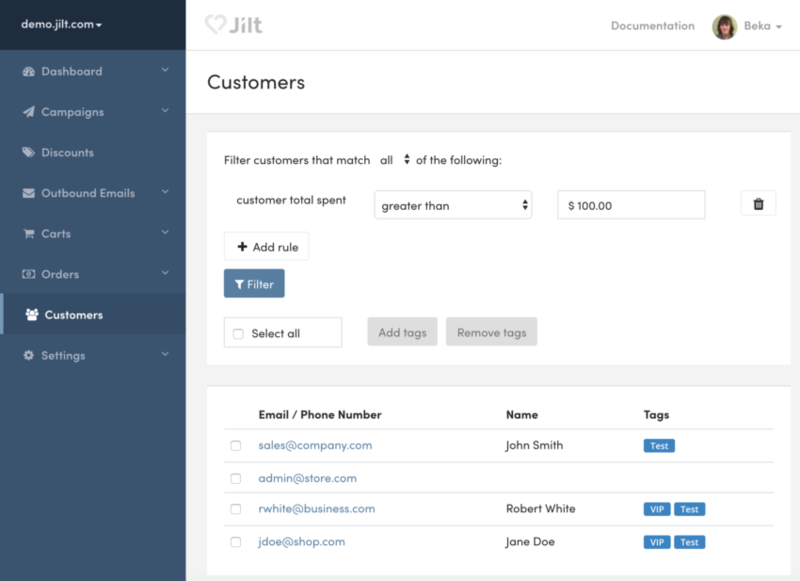 Tags are a new way for you to organize and segment customers within Jilt. Use them to group your best shoppers, to keep track of customers who have expressed interest in an upcoming product launch, or to keep a record of customers who have already been notified about a product recall. The sky is really the limit! Tagging your customers would be pretty tedious if you had to do it one-by-one. We added a set of new filters to the Customers screen so you can easily find customers who match certain segmentation rules. Say you want to find all customers who have spent over $100 in your store, so you can tag them “big spender” and more easily send them promotional emails in the future. Now you can filter them from the Customers screen, select all, and then apply a tag to everyone at once. A couple of weeks ago we mentioned that we were working on a better integration with Zapier to allow you to connect Jilt to over 1,000 other apps. The new and improved integration, which uses pre-defined triggers, is now available in beta! Using this integration, you can now trigger Zapier to take an action in another app whenever your store has a new customer, a customer is updated, a customer unsubscribes, or a customer abandons a cart. We’re looking for beta testers to take this for a spin. Interested? Let us know. While you may not see this in Jilt, our team is focused on our own Black Friday / Cyber Monday (BFCM) preparations. We’re putting our infrastructure through its paces with load testing and other performance assessments over the next few weeks. Rest assured that when BFCM rolls around, Jilt will remain speedy and performant to support your biggest sales opportunity of the year. The entire team will be available through the BFCM period to help with questions or problems.